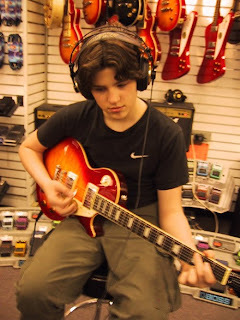 When my son Grant was 12 or 13, graduating from middle school, we promised him a guitar. 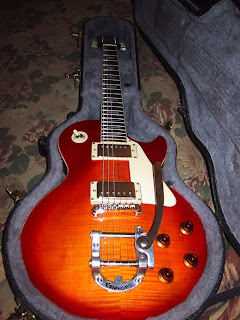 But he had a very specific guitar in mind..it had to be a Les Paul Epiphone, with a sunburst and a Bigsby Arm! Our friend, a studio guitar player, had patiently trotted him over to Manny's and across the street to Sam Ash to play every guitar on the wall that came close to the specifications. There was a sunburst with no Bigsby (above) and there was a blue one with a Bigsby which we reluctantly put on hold until the big day...his graduation. For weeks he pleaded, "Please mom, can I have the guitar" but no, it was a graduation present .....end of story! "Is that a Les Paul?" I said exuding more knowledge than I had data to back up. "Yes" he said drolly. When we reached the ground floor he opened the case, and lo and behold...it was the very guitar, the dream spec guitar...the Les Paul Epiphone with a sunburst AND a Bigsby arm! Not only was the guitar for sale, some odd job lot the guy had gotten off of ebay....but it was the same price as the one we had laid away. Now the best part about this next bit, when i interviewed Les Paul below with Joey Reynolds...Joey told him the story of what happened next. So I knew that Les played at the Iridium every Monday night and that he signed guitars after the show, so Grant and I to the 'axe' up there the next Monday and Les signed it...To Grant Keep Pickin, Les Paul" but as he finished it, his sleeve smeared the marker and the signature was blurred. I mean only cause I'm OCD Mom did it bother me. Now the fun begins, I call Gibson and wind up going to their luthier in Times Square and he tries to take the signature off, but it won't budge and then he says, let me try one more thing, and I don't know but it was a simple thing and voila, it was clean....so Grant and I schlepped, yet again, to The Iridium and Les signed the guitar for a second time and this one we sealed in some plastic stuff so it's there forever. 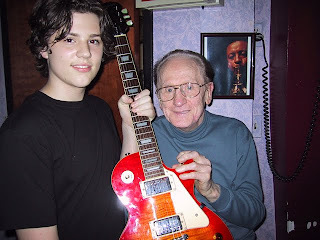 But it's such a great story and I'm so grateful I was able to interview Les on the Joey Reynolds Show in 2005 when he was 90...if there was ever an argument for Joyful Aging...it was Les Paul. In my humble opinion, Les Paul single handedly invented rock and roll. I got to tell him, when, as a girl in Hollywood, listening to the radio it was what was called, "Popular Music"...and then one day, I heard Les Paul and Mary Ford, "How High The Moon" and I was hooked on Rock and Roll for the next 50 years!